Now put this knowledge into practice to improve how you work! Did you know that for most people, emotional intelligence is more important than one’s intelligence in attaining success in not only their lives but careers as well? As individuals a lot of our success depends on our ability to read other people’s signals and react appropriately to them. Breaking down Emotional Intelligence. Peter Salovey and John D. Mayer have been the leading researchers on emotional intelligence and proposed a model that identified four different factors of emotional intelligence. 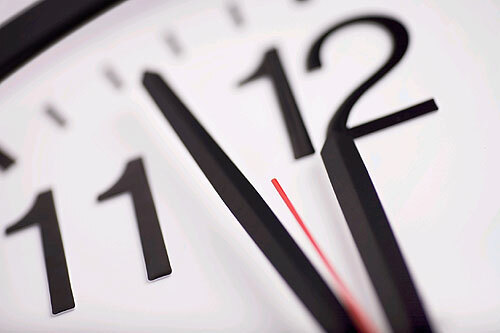 Perceiving Emotions: The first step in understanding emotions is to accurately perceive them. Reasoning with Emotions: The next step involves using emotions to promote thinking and cognitive activity. Understanding Emotions: The emotions that we perceive can carry a wide variety of meanings. If someone is expressing angry emotions, the observer must interpret the cause of their anger and what it might mean. Managing Emotions: The ability to manage emotions effectively is a key part of emotional intelligence. 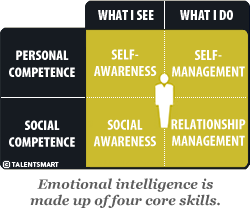 Travis Bradberry, in his Forbes article titled “Emotional Intelligence – EQ” uses the below graphic by TalentSmart to explain that emotional intelligence is made up of four core skills that pair up under two primary competencies: personal competence and social competence. As described by Travis Bradberry, personal competence is made up of your self-awareness and self-management skills, which focus more on you individually than on your interactions with other people. Personal competence is your ability to stay aware of your emotions and manage your behavior. Social competence is made up of your social awareness and relationship management skills; social competence is your ability to understand other people’s moods, behavior, and motives in order to improve the quality of your relationships. For a more thorough and interesting overview of Emotional Intelligence, check out Travis Bradberry published Forbes article by clicking here. Lastly, the “Emotional ID and You” infographic provided by eleraninginfographics.com created by the University of Maryland dives deeper into what emotional intelligence entails as well as why it’s important in the workplace. Reference: Meyer, J.D., & Salovey, P. (1997). What is Emotional Intelligence? In P. Salovey & D.J. Slyter (Eds.) Emotional Development and Emotional Intellgence. New York: Basic Books. The workplace is ever changing. Social and technical dynamics of the workplace are constantly shifting and that means that the skills that are important in today’s working culture may no longer be valuable in a few years. The website Top 10 Online Colleges has created an infographic that documents “The 10 Most Important Work Skills In 2020”. Take a look at the below infographic and see what they list as the “Future Work Skills of 2020” and the “6 Drivers of Change” for those skills. You may want to start cultivating these skills in the near future!